Cheese is a traditional product that is widely used in everyday cooking. As it is dairy based, traditional cheese is not accepted in a vegan diet. Cheese has a wide range of product properties that are difficult to match on a plant base. The aim is to get a vegan version that is nice to eat on its own, sliceable, grateable, stretchable and can be melted in the oven. At KaTech we have developed different vegan cheese alternatives to match the dairy originals with their different product properties. You will find vegan solutions for gouda, mozzarella, feta and pizza cheese. As the original gouda, our vegan version has several product properties. It can be sliced, cut into chunks and is grate-able. The cheese can even be pickled in herbal oil without softening over time. 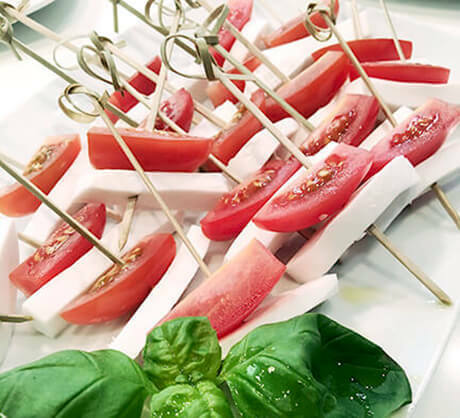 Traditional mozzarella has a very specific texture and appearance. Our vegan alternative has similar product properties. It has a fibrous texture, when pulled apart known from traditional mozzarella. It can be sliced and baked in the oven without the stringy effect and it tastes nice on its own. So “Mozzarella” with tomato and basil can be found again on the plates of vegans. Consumers have certain expectations when they think of feta cheese. A cheese with brittle texture in brine. At KaTech we have managed to develop a vegan “feta” with this brittle texture that can be marinated in brine without softening over time. At KaTech, we have been working on a specific vegan cheese alternative for pizza. The focus was on the stretching effect of cheese during baking. Our vegan pizza cheese melts in the oven, giving a nice stretch that matches the dairy original perfectly. The big challenge of producing vegan cheese alternatives is to use the right equipment that can give enough sheer. The dry matters of the products are very high, so a high shear is necessary to achieve a nice and even product. Fine food manufacturers or manufacturers with high shear equipment could produce this product. If you want to find out, whether you would be able to produce these products in your production site, please get in contact with us. Whether you are looking at reducing fat in the product or you need to optimise your process costs, KaTech has a vast knowledge on how single ingredients react in combination. With our expertise, we can look at recipes and reduce costs significantly while keeping the quality of the final product.